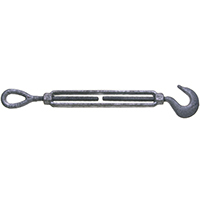 2180BC TURNBUCKLE GATE HOOK Steel wire hook & eyes with extruded aluminum - turnbuckle body Hooks and eyes are zinc plated Designed for heavy warehouse, grain bin, - machine shed doors, etc. 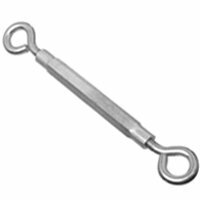 After door is closed and hooked, it can be - drawn tightly shut by rotating turnbuckle Boxed loose 2180BC ZN TURNBUCKLE GATE HOOK SIZE:3/8 x 11"
V196 H-D SCREEN DOOR TURNBUCKLE Steel rods and extruded aluminum turnbuckle - body - rods are zinc plated Designed to brace, raise or eliminate sag, - on the frame of screen and storm doors Heavy-gauge wire for maximum support Visual pack with screws V196 50 IN. 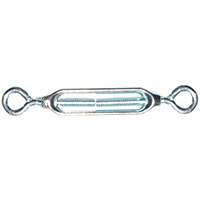 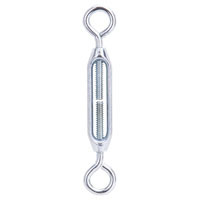 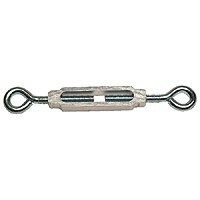 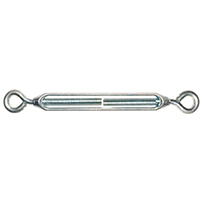 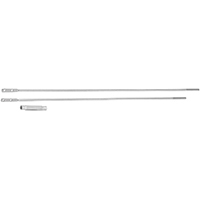 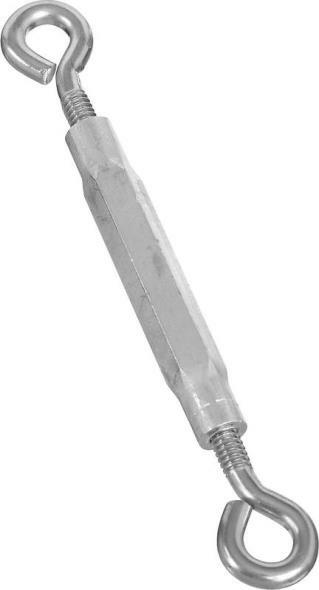 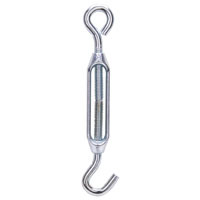 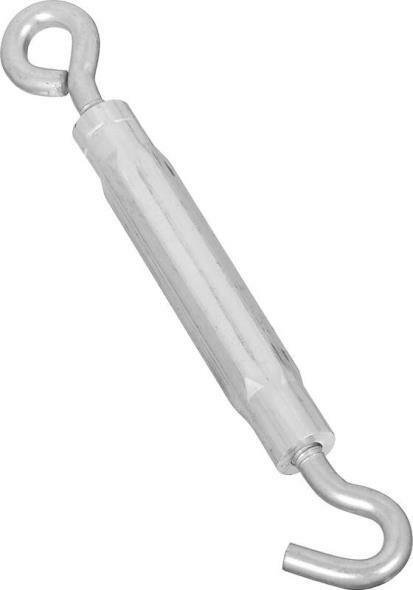 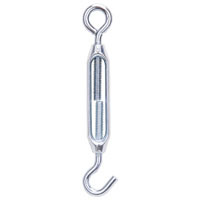 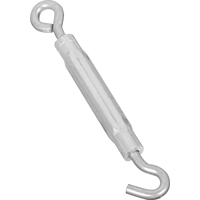 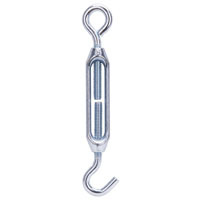 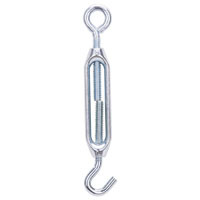 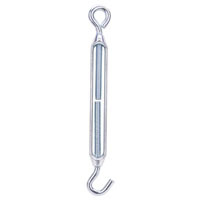 ZN SCRN DR TURNBUCKLE SIZE:50"
2172BC HOOK & EYE TURNBUCKLES Designed for tightening or drawing together - various lines and cables Extruded aluminum hex body allows for ease of - adjustment by hand or with use of a wrench Steel wire hook one end, eye on the other end Zinc plated hooks Packed loose - barcoded Note Safe Working Load (SWL) limits 2172BC 1/4X7-1/2 ZN TURNBUCKLE SIZE:1/4" x 7-1/2" SWL:90 Lb. 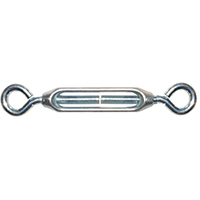 2170 SERIES EYE / EYE TURNBUCKLES Designed for tightening or drawing together - various lines and or cables Extruded aluminum hex body allows for easy - adjustment by hand or with use of a wrench Zinc plated steel wire eye on both ends Packed loose - barcoded Note Safe Working Load (SWL) limits 2170BC 1/4X7-1/2 ZN TURNBUCKLE SIZE:1/4" x 7-1/2" SWL:90 Lb. 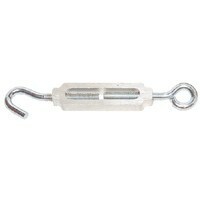 2170 SERIES EYE / EYE TURNBUCKLES Designed for tightening or drawing together - various lines and or cables Extruded aluminum hex body allows for easy - adjustment by hand or with use of a wrench Zinc plated steel wire eye on both ends Packed loose - barcoded Note Safe Working Load (SWL) limits 2170BC 1/2X17 ZN TURNBUCKLE SIZE:1/2" x 17" SWL:320 Lb. 2172BC HOOK & EYE TURNBUCKLES Designed for tightening or drawing together - various lines and cables Extruded aluminum hex body allows for ease of - adjustment by hand or with use of a wrench Steel wire hook one end, eye on the other end Zinc plated hooks Packed loose - barcoded Note Safe Working Load (SWL) limits 2172BC 1/2X17 ZN TURNBUCKLE SIZE:1/2" x 17" SWL:320 Lb. 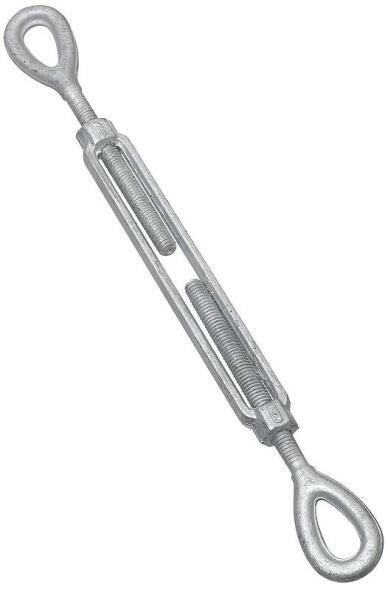 2172BC HOOK & EYE TURNBUCKLES Designed for tightening or drawing together - various lines and cables Extruded aluminum hex body allows for ease of - adjustment by hand or with use of a wrench Steel wire hook one end, eye on the other end Zinc plated hooks Packed loose - barcoded Note Safe Working Load (SWL) limits 2172BC 3/16X5-1/2ZN TURNBUCKLE SIZE:3/16" x 5-1/2" SWL:45 Lb. 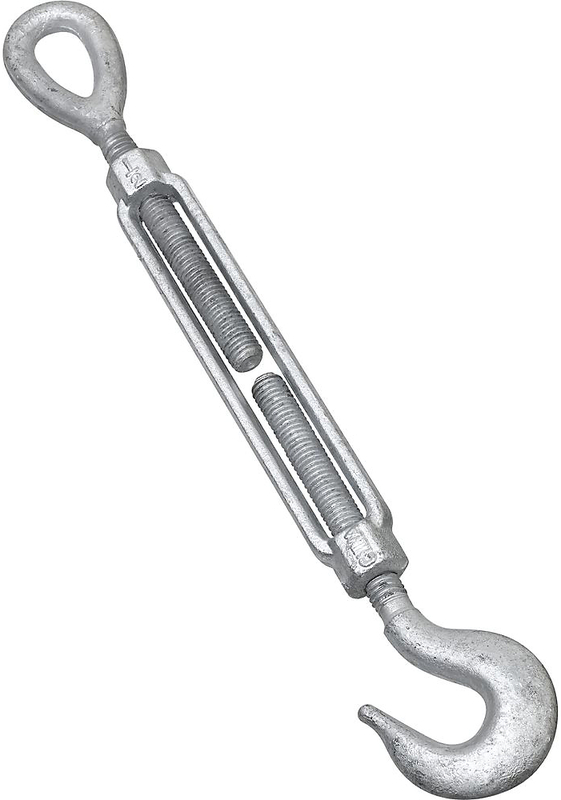 2172BC HOOK & EYE TURNBUCKLES Designed for tightening or drawing together - various lines and cables Extruded aluminum hex body allows for ease of - adjustment by hand or with use of a wrench Steel wire hook one end, eye on the other end Zinc plated hooks Packed loose - barcoded Note Safe Working Load (SWL) limits 2172BC 3/8X16 ZN TURNBUCKLE SIZE:3/8" x 16" SWL:215 Lb. 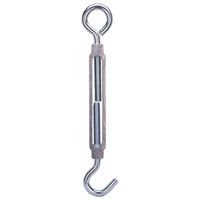 2170 SERIES EYE / EYE TURNBUCKLES Designed for tightening or drawing together - various lines and or cables Extruded aluminum hex body allows for easy - adjustment by hand or with use of a wrench Zinc plated steel wire eye on both ends Packed loose - barcoded Note Safe Working Load (SWL) limits 2170BC 5/16X9 ZN TURNBUCKLE SIZE:5/16" x 9" SWL:130 Lb. 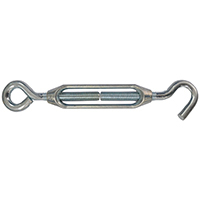 2170 SERIES EYE / EYE TURNBUCKLES Designed for tightening or drawing together - various lines and or cables Extruded aluminum hex body allows for easy - adjustment by hand or with use of a wrench Zinc plated steel wire eye on both ends Packed loose - barcoded Note Safe Working Load (SWL) limits 2170BC 3/8X16 ZN TURNBUCKLE SIZE:3/8" x 16" SWL:215 Lb. 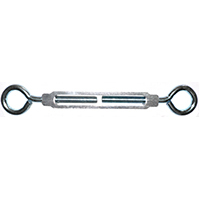 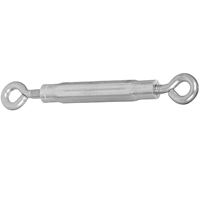 2170 SERIES EYE / EYE TURNBUCKLES Designed for tightening or drawing together - various lines and or cables Extruded aluminum hex body allows for easy - adjustment by hand or with use of a wrench Zinc plated steel wire eye on both ends Packed loose - barcoded Note Safe Working Load (SWL) limits 2170BC 3/8X10-1/2ZN TURNBUCKLE SIZE:3/8" x 10-1/2" SWL:215 Lb.